Whether we’re traveling across the country or just down to the local coffee shop, we’re increasingly on the go. And our laptops, packed with more information than ever before, are usually there with us. That can pose problems-your Mac isn’t nearly as safe sitting on a coffee shop table as it may be at the office. SecuriKey might not keep your computer from being stolen in that scenario. But the hardware-software combo from GT Security will keep the data on your machine safe-and that might be more important in the long run. 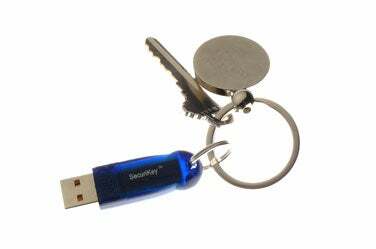 SecuriKey is like a key to your laptop; once you’ve installed the software, you insert a USB key into a port on your Mac to log in. Without the key, no one can log in to your computer, whether they have your password or not. In security terms, SecuriKey provides two-factor authentication for your Mac. Logging in via SecuriKey requires something you know-your password-as well as something you have-the SecuriKey token. Even if hackers look over your shoulder as you type in your password, they’re not getting into your computer unless they have the SecuriKey token. SecuriKey can also do something at least as important as preventing unauthorized logons: it offers you the option of creating an encrypted partition on your hard drive, which every user should do immediately. Using AES-128 encryption, SecuriKey places a partition on your hard drive that is effectively impossible to break. If you’re frequently working on sensitive documents or you have important personal documents on your hard drive, you’ll really appreciate this feature. It’s simple to set up an encrypted partition, and during the setup process you can choose to have your Mac mount the partition upon login. SecuriKey’s initial setup is extremely easy: put the setup disk in your Mac, follow the on-screen prompts, and insert the USB key when instructed. After that, it’s just a matter of having the key inserted in the USB port any time you log in. Setting up additional profiles for other users on a Mac can be a bit confusing at first; the instructions don’t cover a scenario in which you allow other users to use SecuriKey on the same system. Once you’ve figured it out, however, the process of setting up multiple users becomes fairly easy. It would have been better if GT Security had clearly spelled this out in the instructions, though. A problem noted in our last review of SecuriKey ( ) in which our reviewer could not access any accounts on his Macs other than the one set up to work with SecuriKey, is no longer an issue with this version. GT Security provides two duplicate key fobs for your use with a key code unique to your installation. The first is to carry around with you, while the backup should be stored in a safe place in case you lose the first one. Make sure you keep that second key safe, because it can take some time and expense to get a replacement key. More importantly, you need to register the product when you initially install it, because GT Security won’t provide a new key unless you do. Without the key, you can’t access your system, and any data on the encrypted drive can’t be recovered. SecuriKey should offer a whole-disk encryption option, since sensitive data can hide in any number of dark corners of your Mac, but having a securely encrypted partition is sufficient for now. Another minor issue involves removing the SecuriKey token-I experienced a slight delay between removing the key and the system locking itself. That three-second delay is unlikely to be enough time to let anyone do any serious damage to your system, but it’s definitely something to be aware of. If you’re on the road a lot and carrying sensitive information, SecuriKey offers a quick and easy way to keep data on your Mac away from prying eyes. The setup of additional users on your system may be slightly confusing, but overall SecuriKey just works. If you’re a true paranoid like I am, you may want to look into a whole disk encryption product, like the Open Source TrueCrypt project. But for the average road warrior, SecuriKey’s ability to quickly lock your computer and encrypt a disk partition should provide more than enough security.